Welcome to the inaugural entry of my “Meet the Maker” feature! 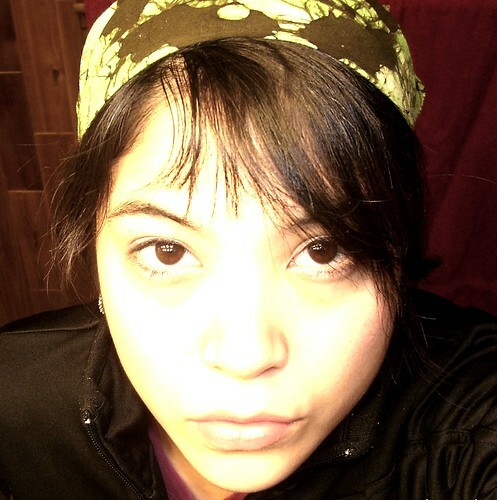 Today’s interview is with Amanda of Plumm. I’ve long admired the clean lines and details of Amanda’s bags. 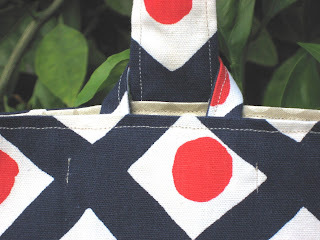 I find her blog insightful and full of a bag-lover’s eye candy. Thank you, Amanda, for agreeing to be my first interview! 1) Tell me about the first bag you ever made. The first bag I made I called the "Gumdrop". It was a cotton candy pink number with cute grosgrain ribbon handles. It was a Christmas gift for my little Niece. I have known how to sew since middle school, but had only done pretty basic projects...like curtains, pillow covers, simple alterations, etc. But, when I couldn't find the perfect little girly bag for my niece I was inspired to take things to the next level. 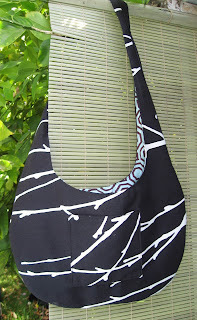 I just did a few sketches, sat down at the sewing machine and made a purse. 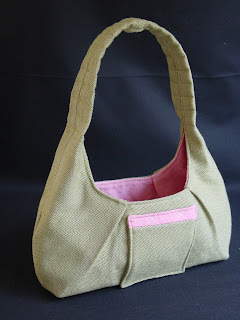 I realized pretty quickly that I just intuitively knew how to do it...I have been making purses as often as possible since that day! 2) What is something you look forward to in your creative process? Without exception my favorite moment in creating my bags is the moment I get to 'flip it'. Meaning when I have finished all of the wrong side stitching, attached the liner to the exterior, and can finally turn it right side out to reveal my finished purse. I almost always work straight through from finalized sketch to finished bag without really stopping...the flipping is when I see how well the picture in my head was brought through to reality. Sometimes I am disappointed, sometimes very pleasantly surprised, but always very excited to see what I've got! 3) What is something you dread in your creative process? Cutting! Arg. I definitely don't love cutting layers and layers of the same shape....not fun. When I am doing the initial cutting for a new design I don't really mind it because it still feels creative...It's the repetitive cutting of making my established patterns that can get tedious. Oddly enough I never mind sewing the bags I've made over and over...just the cutting. 4) What role does Plumm play in your life? Plumm is a beautiful sidetrack, a consuming distraction, a constant companion. My mind really is a constant creative force. Plumm is where I focus the majority of my creative energy. Although I do paint my kitchen cabinets a different color every year or so. I am just obsessed with color and line. I need to see my ideas come to life one way or another...If I can't sew I start to color with the kids crayons, or dream up a new paint scheme for one of our rooms. 5) Corollary: How do you balance Plumm and the rest of your life? I think about new designs, fabrics, and color combos constantly...but I am a stay at home mom to a couple of very active preschool aged boys. This makes it a challenge to get much time to work through my visions. I am pretty much limited to when they are asleep. I am constantly working to maintain the balance between my mommy responsibilities and my need to create...I find myself having to hold back quite a bit right now because the kids need me a lot of the time. As they transition into school I see Plumm growing quite a bit. I really intend to dedicate those hours to creating....we'll see! 6) What are some things of note about the rest of your life? I am married to amazing person...he is a mechanical engineer by day and a Kick a$$ wood turner by night. His Etsy shop is called 'Form'. Being married to someone who is also obsessed with creating makes my life all the better. We feed of each other's creativity and passion. We have two boys. Luke, 3, who is homemade and Zakai, 2, who we adopted from Taiwan about a year ago. Both of them are truly special beings. We are blessed. I also have had Rheumatoid Arthritis since I was 9 months old. Because of this I have a bunch of fused joints in my hands and arms. I am on a pretty effective new medication right now so every thing is just peachy...3 cheers for medical research! 7) What is your favorite tool in your studio? My sewing machine, hands down!!! It's nothing fancy but it allows me to take flat rolls of fabric and turn them into these beautiful, useful objects...That's pretty amazing. 8) Any hints about your next creation? Hmm...Well my sketch book is filling up with wrap skirts right now. I was given a Serger for my 30th birthday (thanks Mom) and as soon as I learn to use it I hope to begin stocking the Plumm shop with some fabulous clothes. I have so many ideas...it's really just a matter of finding time. All photos courtesy of Plumm. Thanks so much for this great opportunity to share a little bit about myself...I'm so flattered to have been chosen. I'm sure your 'Meet the Maker' feature will be a huge success and I can't wait to come back and read the upcoming blogger-views. This is such a fab idea...What a clever girl you are! Great interview and nice blog! I will definitely be checking both of your lovely bags out! 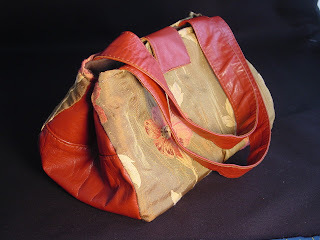 Wonderful,artful bags. Thanks for the pictures and interview! You're very welcome, Amanda - the pleasure was all mine! Thanks for your comments, everyone - aren't Amanda's bags amazing? I thought fireflies were everywhere...sorry you don't have them. Yes, they are romantic. Your blog is nice, I will visit again.